With the latest 1.08 patch, F.E.A.R. has gained multi-core support, potentially using even up to quad core CPUs in order to deliver improved performance. We were able to confirm a performance increase with Core 2 Duo, and we will try to take a look at whether or not Core 2 Quad helps in the near future. 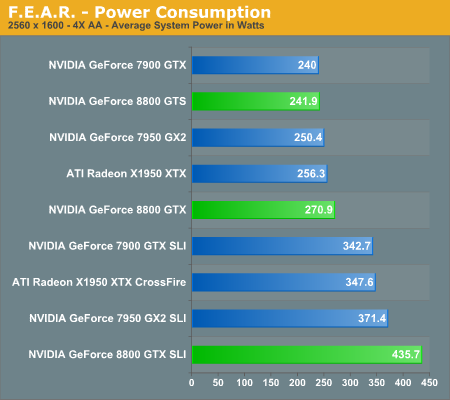 Either way, this means that we should now be completely GPU limited in F.E.A.R. testing. 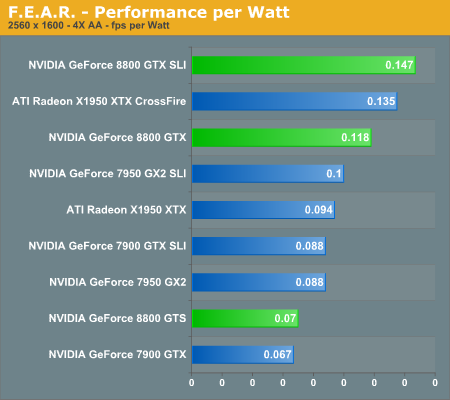 The new GeForce 8800 GTX card still manages to come out faster than the competition, but this time a single 8800 GTX is not able to surpass the performance of dual X1950 XTX cards (or 7900 GTX SLI for that matter). Quad SLI also manages to make a decent showing in this particular benchmark, coming in second place except at the highest resolution. 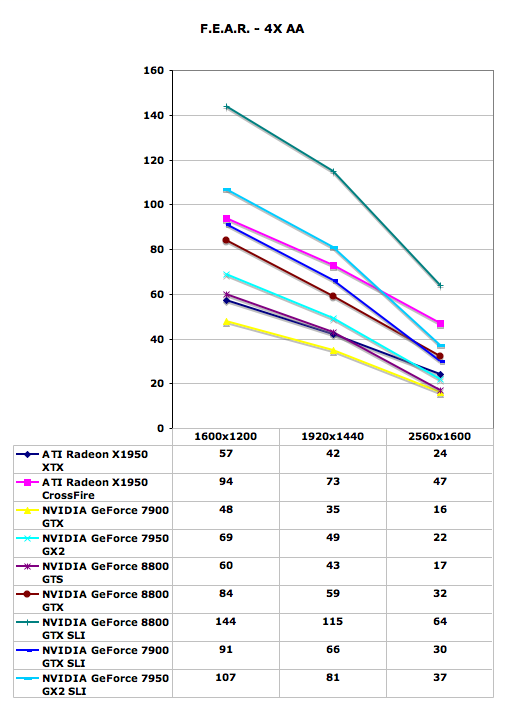 Meanwhile, GeForce 8800 GTS doesn't fare as well, only managing to tie the X1950 XTX for performance, and it even loses that battle at 2560x1600. F.E.A.R. is a game that can use a lot of memory bandwidth, so it's likely that the 2GHz GDDR4 memory on the X1950 XTX is helping out. 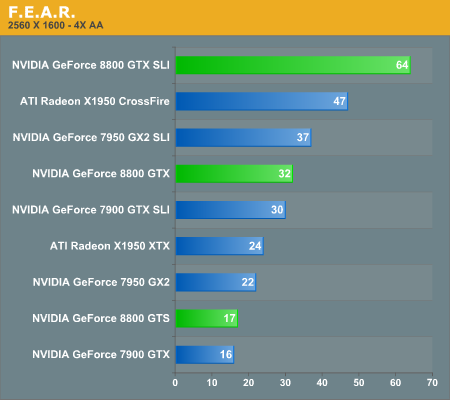 If money isn't a concern, 8800 GTX SLI will finally allow you to play F.E.A.R. at 2560x1600 with 4xAA without dropping below 30 FPS. Is that really necessary? Probably not to most people, but if a similar situation exists in other games it becomes a bit more feasible.